Serious allegations have been levelled at the company, one of the country’s biggest corporate successes. THOUSANDS OF MILES away from her employer’s Dublin base, Oglis Mejia harvests melons under the scorching Honduran sun, struggling to provide for her five children. The 35-year-old single mother has spent her entire working life in the employment of Fyffes, one of the biggest multinational companies to ever emerge from Ireland. She lives in La Permuta, a rural area near the municipality of Choluteca, one of the poorest regions in Honduras. Fyffes subsidiaries employ about 3,000 people, mostly women, in the economically deprived Central American country on a seasonal basis. Mejia starts work at 6am, but she gets up two hours early to prepare food for her children – aged from three to 18 - so that they have something to eat when they wake. Most of the money from Mejia’s job goes towards getting her children through school, but she says that poor working conditions make it hard for her to provide them with a good education. “It’s a very hard working day, we work from 6am until about 3 or 4pm doing different jobs on the plantation,” she tells Fora, speaking through an interpreter. “The hardest job is when we have to seed the melon, because we are down with our backs bent over for the entire day. “In the area where I work there’s about 300 people. We are all under the hot sun, the field I work in is practically a desert and we work under a lot of pressure. “The work is constant: we get small breaks to drink the water they give us, but we immediately sweat it out. Besides the difficulty of the work, Mejia claims that she is paid about 30% less than the minimum wage of 6,848 lempiras (€260) a month and says that she receives no benefits from Fyffes, such as social security. Besides Fyffes, there aren’t many other local opportunities, and Mejia says that many other companies treat their workers poorly. Not working means living in poverty. In an attempt to improve her situation she decided to join a local union, STAS. She and other workers say that the Ireland-based firm doesn’t engage with the union and does not give employees protective clothing when they use chemicals, leading to serious incidents – such as one which hospitalised over a dozen workers. Fyffes has denied all of these claims, saying that it pays the minimum wage, provides decent working conditions and, in general, engages with unions, although it does not recognise the local branch of STAS. Nevertheless, the row has sparked a major investigation by an independent ethical trading body. With Fyffes under increasing scrutiny, several large supermarkets that deal with the company are coming under pressure to make sure that the workers are being treated fairly. Fyffes is one of Ireland’s biggest corporate success stories. The company was established more than a century ago and began its life as a small London-based banana importer. A family greengrocer set up by Charles McCann in Dundalk was the first business in Ireland to sell the company’s fruit. The McCann family took over Fyffes in the mid-80s through their Fruit Importers of Ireland firm. The name of the combined company was changed to simply Fyffes PLC. Charles McCann’s grandson, David, would go on to lead the company and oversee its growth as it became one of Ireland’s few true multinationals, with thousands of employees around the world, sales of more than €1 billion and annual profits in the tens of millions. The firm still has strong local and Irish connections, such as sponsoring the League of Ireland football champions Dundalk FC. It has also had cause for celebration lately with a sale to Tokyo’s Sumitomo Corporation in a deal worth more than €750 million - representing a big payday for the company’s shareholders, including nearly €90 million for the McCann family. However, a cloud is hanging over the firm. Oglis Mejia is one of hundreds of people employed by a Fyffes plantation called Suragroh that has become a flashpoint for worker discontent. The Honduran workers are tasked with tending to the melons by planting seeds, spraying herbicides and pesticides, and harvesting the fruit when they are ready. The work is mainly seasonal, lasting between four and six months. Unions says that Fyffes’ success masks the poor treatment of workers in countries like Honduras, and they have called on Irish consumers and supermarkets across Europe to put pressure on the company to improve conditions at its plantations. The campaign has been led by the GMB, one of the UK’s largest unions, and Banana Link, a UK-based non-profit, along with the local STAS union in Honduras, the US labour rights group LEAP and the International Union of Food Workers. Fyffes, however, has rejected all of the union’s’ claims of poor working conditions and other abuses, sparking an appeal to the Ethical Trading Initiative (ETI) – a UK state-funded organisation promoting workers’ rights that counts Fyffes as a member. The GMB first called for Fyffes to be expelled from the ETI when over a dozen of the fruit company’s workers in Honduras were hospitalised after being exposed to noxious chemicals in February 2016. Fyffes said that the incident was an isolated accident, however Banana Link made an official complaint in April 2016 and the ETI launched an investigation into alleged abuses at Suragroh. That probe has dragged on for more than a year. The complaint consisted of three key points: that workers weren’t being paid proper wages, that their working conditions were poor and that they weren’t being allowed to organise and unionise. Last month Fyffes became one of the only companies to ever be suspended from the ETI. On workplace conditions, the ETI eventually found that the evidence provided was “not conclusive” that the incident that led to over a dozen workers being hospitalised was any more than an accident, but it said that the company should review its procedures. On wages, the ethical trade body said that Fyffes should regularly review and audit wage systems and payments, but it did not say that the firm was paying less than the minimum wage. However, the ETI did say that the firm was contravening the approach to legitimate trade union activities that is expected of members. It said that Fyffes must ensure that workers “across its Latin American supply chains and not just in Honduras benefit from meaningful and practical action”. The trading body has now warned that the company has to hammer out a deal with workers or it will be expelled, something that would prove highly embarrassing and troubling for Fyffes. So how did the company end up in this position? While workers say there have been abuse claims at Fyffes plantations before, notably in Costa Rica, the issues being investigated by the ETI go back about two years ago. This was when Fyffes workers in Honduras first set up a subsidiary of the agriculture workers’ union STAS after complaining about pay and working conditions. Since then, local union representatives say that dozens of workers have filed lawsuits for what they claim is the underpayment of wages. Unions allege that during the 2015/2016 growing season the company withheld bonuses, grants and overtime pay worth about €1.7 million, a huge amount for the Honduran workers. Staff also claim that they have to buy their own equipment and are not given protective gear when using chemicals, leading to accidents like the one in February 2016 when more than a dozen Suragroh workers were hospitalised after being poisoned by noxious chemicals. Fyffes did not respond to specific questions about the alleged underpayment, however it previously said it provides all the necessary safety equipment – and that it pays all workers in line with Honduran national regulations. In the case of the February incident, the company said it was an accident, and that it has acted to ensure that there is no repeat. For its part, the ETI said “the evidence is clear that the company responded in a responsible way” – although it should also review its practices. As well as the dispute over work conditions, workers say that there is also a serious issue for those trying to unionise. They claim the company took a dim view when the STAS branch was formed about two years ago. State officials were also said to be unimpressed, with the Guardian reporting last year that the country’s agriculture minister was worried Fyffes may leave Honduras if workers persisted with the union. Organising a union in the Central American country is very different to Ireland, or most developed nations. Honduras has one of the highest murder rates in the world and dozens of trade union activists have been killed over the last few years. Moisés Sanchez, the secretary-general of STAS, worked with Fyffes for more than 20 years, however he claims he was sacked about a year ago when he tried to form the union branch with other local workers. “I was the irrigation supervisor. I’m not a professional, but I learned throughout the 20 years that I worked for the company,” he tells Fora, also speaking via an interpreter. “I was contracted from June to October and then from November to May. I asked for a permanent contract and that gave them more of a reason to fire me, because I was involved in a union and wanted to be a permanent worker. Sanchez, who is married with five children, took his redundancy hard. “My whole family depended on me. I want to provide the best life I can for my kids, but now I can’t because I don’t have a job,” he says. A local union organiser, Ahrax Mayorga, says that of the 165 union member at Fyffes plantations, 35 were not re-hired for the new harvest season in November “as a condemnation for joining the union”. “The rest have continued working, but they have been slowly phased out. The excuse of the company is that there’s no more work for them to do, however we are aware that they’re hiring new workers to replace the union members,” he says. Among those claimed to have been dismissed for being union members are the bulk of the company’s security workers at its Melon Export subsidiary in Honduras. They say that 47 of the 65 security staff joined the local union and were subsequently made redundant in March. Fyffes has said it does not sack any worker for being a member of a trade union, although it admits that it made the security staff redundant. The company said that there has been an increasing trend in violent crime directed at security staff “giving concerns over their safety”. “Following a trial, the company is transitioning its security services to independent companies registered at the Ministry of Internal Security,” a spokeswoman said. 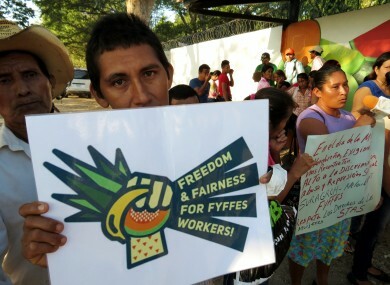 Fyffes has been backed by the Honduran Ministry of Labour in its stance of not recognising the local STAS branch, which the company says was not properly formed. However, the unions are appealing this decision and say that the government favours the company as it does not want it leaving Honduras, something which would cause devastation for the poor country. The ETI has said that Fyffes and Suragroh need to do more in engaging with the trade union movement and start a dialogue with those who represent workers “whether permanent or seasonal, to resolve outstanding issues and build trust”. Against the backdrop of the issues at the Fyffes plantations, the ETI spent more than a year examining the union’s complaints. It was quiet for a while after problems were first raised in April 2016, however in November it said that, after reviewing evidence submitted by all parties to the dispute, it had upheld “key aspects of the complaint, deeming them substantive and robust”. In a statement to Fora, it said it found the complaint was “substantive in the way it evidenced poor treatment of workers in Fyffes’ Suragroh melon plantation”. It didn’t explain the apparent inconsistency in the fact that it found that workers were treated poorly but Fyffes was only officially pulled up on the issue of not engaging with unions. The company was asked to prepare a remediation plan, however the ETI found that the fruit firm’s proposals failed to fully address the issues raised. Fyffes was then given until early February to come up with a proper strategy. It instead opted to exercise its right as a member of the organisation to present its case to an ETI committee. That committee finally recommended that Fyffes be suspended from the ethical trading body – ordering it do hammer out a deal with unions or be expelled. While the dispute has barely registered in Ireland, it has gained more traction internationally. The unions contacted dozens of supermarket chains across the UK – many of which also have large operations in Ireland – and urged them to raise the alleged labour abuses in Honduras with Fyffes. They view putting pressure on supermarkets as the best way of resolving the dispute. Unions hope that supermarkets, worried about their reputations, will be less likely to buy Fyffes products if the fruit producer is linked to poor worker treatment. Sainsbury’s, Morrisons and Aldi – all Fyffes customers – told Fora that they do not buy products from the Suragroh plant in Honduras but added that they have been in touch with the company about the issues raised. Sainsbury’s said that it take its suppliers’ approach to trade “very seriously regardless of where they are sourcing from and are already in close contact with Fyffes about the points which have been raised”. Aldi said that “as part of its commitment to fair trading, it is currently in conversations with Fyffes around the concerns raised”, while Morrisons simply said that it raised the issue with the firm. Tesco said it would “monitor progress” on the issue and that it was ”supportive of (the ETI’s) encouragement” for Fyffes to work with unions. None said what action they might take. However, Fora understands that some of Fyffes’ customers have put pressure on the company to reach an agreement in the wake of the firm’s suspension from the ETI. Meanwhile, through the Make Fruit Fair campaign, a mix of NGOs that look to improve the conditions of workers who produce tropical fruit, Fyffes chairman McCann has been sent emails by 23,000 people calling for the company to ensure its workers’ rights. No Irish unions have really been active in lobbying Fyffes, although members of the Irish Congress of Trade Unions joined a GMB protest at the fruit giant’s annual general meeting in Dublin in January. Unions used the opportunity to complain that the company’s workers faced financial hardship while the McCanns got a nest egg. At the meeting McCann said simply that Fyffes “has a different perspective to the protestors” and declined to comment further. In the time since the ETI started its investigation, the takeover by Sumitomo has been completed and Fyffes has de-listed from the Irish Stock Exchange. However, it retains its head office in Dublin and the company is still largely an Irish one. It is understood that negotiations between the ETI and Fyffes are being handled by the Irish senior management team, including McCann. GMB official Bert Schouwenburg, who headed up a delegation to inspect the plantations in Honduras earlier this year, says that, abroad, Fyffes is still viewed as an Irish company. He claims that the controversy involving the ETI and the Honduran allegations has dented the reputations of other Irish businesses operating overseas. “Fyffes is synonymous with Ireland, and it is darkening the name of the country,” he says. After being formally suspended from the ETI early last month, Fyffes has 90 days to reach an agreement with unions, meaning it has until the start of August to strike a deal or face being kicked out of the trade body altogether. This would be almost unprecedented for the ETI, and would be highly embarrassing for the company. However, it would come as little comfort to workers who want to strike a better deal. Back in La Permuta, Oglis Mejia says some extra money would help her pay for her children’s education and improve their diet, which consists mainly of rice and beans. She also called on Irish people to help the workers by putting pressure on Fyffes to strike an agreement. Union officials and workers believe that Fyffes will be protective of its image in Ireland and will likely take action if local consumers and supermarkets raise a fuss. “We want workers in other parts of the world to recognise what we’re doing and to continue supporting us, as workers whose rights are being violated,” Mejia says. Email “'It's darkening Ireland's name': Inside the row between Fyffes and its Honduran workers”. Feedback on “'It's darkening Ireland's name': Inside the row between Fyffes and its Honduran workers”.